"There are no universally effective programs, but here are knowable principles that need to be incorporated in all programs about how we teach written language." The following is a list of some programs that have been developed for struggling readers and writers. Some were created specifically for dyslexia and are underigrded in the tenets of Structured Literacy (e.g., the Orton-Gillingham approach, multi-sensory approaches). Depending on the program, it may focus on one of more of the various skills that underlie reading—oral language, phonemic awareness, vocabulary, comprehension, spelling, or writing. You will need to determine which program works best for your child. Most generally, these programs are best used in an individual or small group therapy setting. Professionals will want to familiarize themselves with the program. Some require specific training. For example, Orton-Gillingham is a multi-faceted approach that was created specifically for dyslexics. It teaches reading, writing, and spelling by using auditory, visual, and tactile measures. Many other reading and writing programs utilize the Orton-Gillingham approach. When researching a Structured Literacy-based program, such as one that is built on the Orton-Gillingham approach, either for training courses or to access a certified tutor or therapist, look for programs/courses that have been accredited. The International Multisensory Structured Language Education Council (IMSLEC) holds their accredited courses to rigorous standards that in turn allow the courses to certify qualified individuals who meet these standards as teachers, therapists and instructors. These accreditation-certification credentials ensure access to reliable and effective instruction. Other reliable resources for programs serving dyslexics are found through the Academic Language Therapy Association and the International Dyslexia Association. In addition to the program descriptions, we have provided a table that summarizes some of the programs and their varying features. All About Reading teaches phonics, decoding, fluency, and comprehension in a fun and engaging way. All About Spelling teaches encoding skills, spelling rules, and multisensory strategies to help students become proficient spellers for life. The Barton Reading & Spelling System is a one-on-one tutoring system that improves spelling, reading, and writing skills. It works well for children, teenagers, and adults who struggle due to dyslexia or a learning disability. This multi-sensory mnemonic strategy facilitates language organization. The kit targets elementary school students, though it can also be used with older students to help with vocabulary, writing, and organization. Produced by the Neuhaus Education Center, this manual contains a set of passages marked at the hundredth word. A child can read the passage to the hundredth word while a parent times how long he takes and tracks his progress over time. This program offers reading, writing, spelling, and grammar instruction, in addition to multi-sensory components. It also offers an English as a Second Language (ESL) component to assist users who are struggling to master the language. Comprised of three programs, this method encourages improved reading comprehension by targeting basic phonemic awareness through a mix of blending, segmenting, and sound exercises. This program encourages phonemic awareness by helping users understand how mouth movements correspond to spoken sounds. Children can then apply this understanding to their speech, spelling, and reading and see improvements. This research-based reading program starts with the user distinguishing letters and letter sounds and ending with the user reading full sentences and stories. In the end, the user can comprehend and analyze what he or she just read. While not a reading program or curriculum, Moose Materials are activities and games that can support many Multisensory Structured Language Programs. They provide students with the reinforcement necessary to master reading and spelling. Nessy helps students master foundational reading skills. This program is designed to meet the Common Core and most rigorous state standards, the structure is systematic, and data reports are clearly organized and easy to understand. Project Read is a language arts curriculum that is carefully designed for all age groups and learning profiles. Piloted in 1969 by Victoria Greene, the Project Read program has helped students in areas of phonics, reading comprehension, and written expression. From its inception, the three guiding principles have been direct instruction of the concepts and skill of language, presentation of concepts and skills in their dependent order (from simplest to most complex), and multisensory strategies and materials created specifically for each concept and skill. The curriculum is designed to be delivered by regular classroom teachers, and offers a variety of products to cater to each classroom’s needs. Project Read has been proven to help close the learning gap by increasing test scores, meeting state standards, and enriching existing RTI models. In addition to classroom materials, Project Read offers staff development tools for effective intervention in reading, written, and oral language. This curriculum is designed to improve reading fluency and comprehension of 2nd - 5th graders. Through word play activities, the RAVE-O systematically walks students through carefully selected core words at the phonemic, orthographic, semantic, syntactic, and morphological levels. This program aims to improve reading proficiency through teacher modeling, repetitive reading, and student progress monitoring. It provides students with practice reading and writing problems that help the practitioner gauge progress and set reading fluency goals. This desktop app was published with the potential to help challenged readers of all ages who struggle to read digitally-generated text. This app provides more customizable focus, color and additional options for individual users than any other tool of its kind available. The REWARDS program is a family of reading and writing intervention materials created for young struggling learners. The program aims to increase fluency rates, enhance reading comprehension, and increase precision in sentence writing. The Sonday Systems are beginning and intermediate reading intervention programs that use the Orton-Gillingham approach to language instruction. Students will learn and systematically go through core reading and writing skills such as sound blending, basic vocabulary, handwriting, and reading comprehension. The programs include complete lesson plans and instruction material for teachers. This unique program offers specific activities that are tied into a student's curriculum and that assist students with spelling, reading, and writing. The program emphasizes the five categories of word study: phonological awareness, phonics, vocabulary, word parts and related words, and mental images of words. This program explicitly teaches fluency skills and reading practice. It aims to help readers apply their knowledge to connected text, and it complements any reading program that directly teaches the structure of English words. This language-based program teaches the fundamentals of vocabulary and language by giving its users the tools to understand the English language coding system. It utilizes the Orton-Gillingham multi-sensory approach to assist readers. 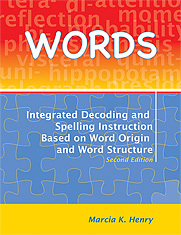 Marcia Henry's book, Words: Integrated Decoding and Spelling Instruction Based on Word Origin and Word Structure – Second Edition, now includes reproducible student activities and expanded progress-monitoring tools. WORDS emphasizes decoding and spelling based on word origin and word structure, thus strengthening students' ability to decode, comprehend, ans spell. To learn more about the Orton-Gillingham approach, visit Special Education Advisor's Orton-Gillingham: Who, Where and Why? page.